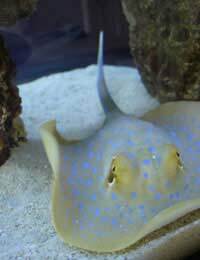 With their distinctive body shape and fascinating habits rays are intriguing animals, and many aquarists dream of owning them. However, they cannot be recommended for any but the most experienced. Their sensitive natures require careful handling and their large size makes them inappropriate for most home aquariums, with even the smallest reaching three feet in length. They are also long-lived. Keeping rays is a serious commitment. That said, if it is approached properly, it can be extremely rewarding. Rays are closely related to sharks and have many of the same basic needs. They need large aquariums in proportion to their body size because they lack the maneuverability of most bony fish. They also need a comparatively bare environment, free from obstacles on which they might injure themselves and with no heavy rock work which they might knock over when digging. They benefit from having access to simple hiding places like caves. The aquarium should have a fine sandy substrate which they can bury themselves in. Avoid coarse grains or gravel, which can damage their sensitive skins and lead to infections. Despite their carnivorous nature, rays are relatively peaceful fish and can get along well in carefully selected community tanks. Large clown loaches make excellent companions, eagerly interacting with them. Beware of including tank mates like angel fish and butterfly fish which will often bully rays by picking at their skins. Because rays are delicate you should be especially careful when moving them. Never use a net on an adult ray - a bowl is a much better choice. Rays do best of a varied diet of live food, including plenty of shrimp and crustaceans. They can survive on a frozen food diet, but this often leads to vitamin deficiencies. Many rays prefer to eat at night and do well if food is added to the aquarium just after lights-out. They can be reluctant eaters when feeling stressed; if this happens, particularly with a new fish, be patient, as a healthy ray can go for as long as two weeks without eating. Wild rays are not heavy eaters, so feeding yours once every two to three days should be quite sufficient. Whilst there are numerous species of ray, only a few are suitable for aquarium life. Listed here are some of the most common. Yellow Stingrays -Among the smallest rays available, these lively fish are relatively hardy but will need plenty of space to move around in. They prefer brackish water. Golden Spot Stingrays -These attractively spotted freshwater rays are among the easiest to care for, but be careful of their very rough skins. Polka Dot Rays -With their striking pattern of white dots on a black background, these freshwater rays are extremely popular. They are highly active and can sometimes be aggressive towards other rays. They can be very expensive and they eat more than most other rays. Brazilian Electric Rays -Despite their ability to produce a strong electric shock, these mottled brown marine rays are gentle by nature and are comparatively small. Since the death of naturalist Steve Irwin, public awareness of the danger of stingrays has grown. The good news is that stingrays are peaceful creatures which will use their venom only if they feel a desperate need to protect themselves. Even when they do sting, it's rarely fatal. However, accidents happen, and even a mild sting should be followed up with a hospital visit, as stingray venom can lead to tissue necrosis and secondary infections by bacteria which are difficult to treat. If you should be stung by your ray, immediately immerse the injured area in water as hot as you can stand. Don't use a tourniquet, but attempt to control bleeding, and summon medical attention. For all the difficulties involved in keeping them, rays can be extremely satisfying pets. Highly intelligent, they are capable of learning many new behaviours and are often pleased by direct interaction with humans, including being stroked (though this should be done very carefully) and being hand fed. If you are patient and gentle, your ray will appreciate it and you will have the chance to form a solid bond which goes way beyond the usual fish keeping experience.